The Radisson Resort Parkway has become a buzzword recently due to it's excellent rates (as low as $63/night at the time of writing) and it's proximity to Walt Disney World. So in August 2003, we set out to see what all the fuss was about, and if it was good enough for our PassPorter readers. The verdict? Radisson Resort Parkway is more than just a "cheap stay" -- it's a really lovely resort with gorgeous pools, well-manicured grounds, very comfortable rooms, and more services than you'd expect from an inexpensive resort. We give it two thumbs up! Phone: 800-634-4774, 407-396-7000, or 407-396-6792 (fax) - Ask for the "Y-PASS" rates for our special PassPorter rates! Rates start low, very low -- at the time we write this review, you can get a room for as low as $63/night between 9/5-10/2/2003 (see rates at the end of this review). As a rule of thumb, rates here are below All-Star and Pop Century rates, and yet the resort's amenities put it in the "moderate" class rather than the "value" class. So you get the equivalent of a moderate resort (such as Caribbean Beach) for less than the price of a value (All Star or Pop Century). "Spacious" is the keyword here. 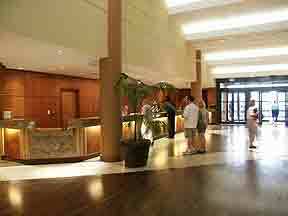 The lobby is cavernous, the free-from pool is huge, the grounds are extensive, and the rooms are generous. 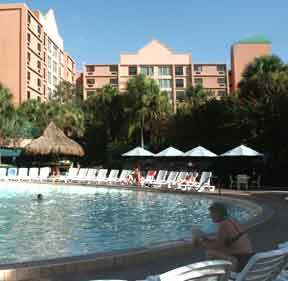 This resort can be booked to capacity and you will not feel crowded, which cannot be said for, say, All-Star Resorts. But this isn't just a big resort with a lackluster feel. 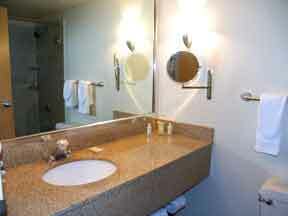 The resort was recently updated and improved in 2001, and everything feels modern, polished, and well-maintained. The lobby is lovely, dominated by warm woods and skylights. In fact, "warm" could be another keyword here -- all the woods, colors, and lights are warm and relaxing. There's very little to report here, and that's a good thing. Check-in was quick and easy. There were no hidden surprises (like we've gotten at other bargain hotels) and the staff was courteous and efficient. Our luggage was collected by the bell staff when we arrived, and sent up to our room once we checked in. Our first impression of the guest rooms were the unique furnishings and fresh decor. Unlike so many other Orlando-area hotels that go for your basic tropical theme, the Radission uses a modern Italian look... and to great success. More warm woods, soft lighting, and clean lines give the rooms an inviting European feel. All rooms come with either two double beds or one king bed, a chair and ottoman, desk and chair, 25" TV with remote, two phones with dataports, coffeemaker, iron and ironing board, marble vanity, hair dryer, make-up mirror, large in-room safe, and mini-bar. High-speed Internet access is also available through the TV for a fee. Toiletries included ASiRA shampoo, conditioner, lotion, and a shower cap. We were fortunate to stay in a deluxe room (see photos), which replaces the floral bedspread with a big, fluffy duvet (very European). All rooms open onto an interior hallway, unlike Disney's value and moderate resorts. Two views are available: courtyard and pool. Rooms do not have balconies or patios, but the windows are large. The rooms are situated among six buildings (1000, 2000, 3000, 4000, 5000, and 6000). 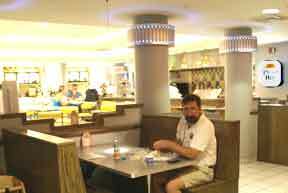 We stayed in the 6000 building and really enjoyed its proximity to the shuttle stop, the pools, and the restaurant. In general, however, all the buildings are well-located. The only one that seems to be a bit out-of-the-way is the 3000 building, and even that has its advantages as it is near the lobby, tennis courts, and playground. 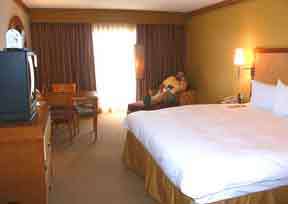 Dave relaxes in our deluxe room with a king bed. The biggest draw here are the wonderful pools. One very large, free-form pool (see photo) is the focal point, featuring a 40 ft. waterslide and waterfall. Nearby is a kid's wading pool, two hot tubs, and another heated "quiet" pool. 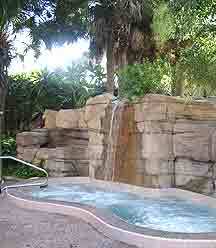 One of the hot tubs is tucked out of the way in a delightful little grotto. In addition to the pools, there are two lighted tennis courts, a sand volleyball court, a playground, an arcade, a fitness center, and a walking/jogging path. Note that there are plans to improve the playground and add some familiar characters to it! To see another photo of the pool which gives you an idea of how large it is, click here. And there are virtual tours of both pools available at the Radisson site. A good-sized gift shop is available in the lobby, too. 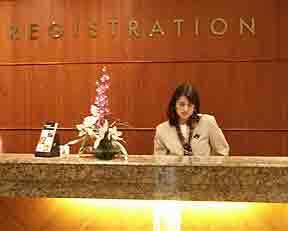 Convention and banquet facilities are also available, as is a business center (open from 8-5 pm, M-F). Free shuttles are available to Walt Disney World, Universal Studios, and Seaworld, and this is one of the few hotels do this. The shuttles operate on a schedule and unlike the Disney buses used at the Disney resorts, these are like traditional touring buses, and hence more comfortable. The biggest drawback to these shuttles is frequency: the Disney shuttles pickup/drop-off 4-6 times a day, the Universal and Seaworld shuttles pick-up/drop-off 1-2 times a day. If you're like us, your schedule doesn't fit their schedule. We ended up taking a taxi twice from this hotel, because the shuttle had already left. Also, the buses drop-off at the Ticket & Transportation Center, and you need to catch another bus/monorail from there to go to other parks. Thus, while there are shuttles, we strongly recommend you have a car when staying at any off-property resort. There is free self-parking at the resort, and Thrifty Car Rental has a desk in the Radisson lobby. The Radisson is just 1.5 miles (as the crow flies) from Walt Disney World, so transportation is quick and simple. In fact, the resort is right across the street from Celebration, Disney's community! Radisson Resort Parkway is off of 192, just east of I-4. We enjoyed two meals at this resort -- a quick breakfast at the 50s-themed Parkway Deli & Diner and a more leisurely breakfast buffet at the restaurant. Both were satisfying. The Diner (see menu) is open all day and offers Pizza Hut pizzas (very popular here), Krispy Creme donuts, Starbuck's coffee, Edy's ice cream, sandwiches, salads, shakes, and malts. There's a jukebox in the corner that livens up the atmosphere. The restaurant is currently known as "Cafe in the Court" but will be getting a new name to go along with its recent remodeling. Breakfast buffets ($8.95/adult) are fresh and hearty at the restaurant, and the Kids Eat Free program can make it a real bargain, too (applies to kids 10 and under who are with a paying adult). Dinner is also offered, though we can't comment on that as we didn't have time to check it out. 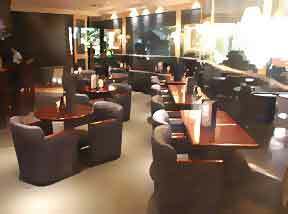 There's also a Sports Lounge and the Cascade Pool Bar, both of which offer drinks and snacks. Room service is offered from 6:30 - 11:00 pm. 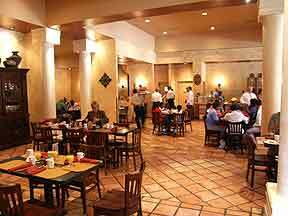 If you need more choices, you can take a 5-10 minute walk to one of several restaurants in the immediate area. All in all, we're very impressed! 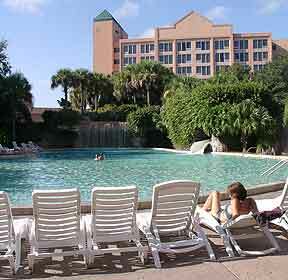 Radisson Resort Parkway is one of the few off-property hotels we really recommend to PassPorter readers! It's upscale, fun, and affordable! Hot Tip: We are pleased to be able to offer incredible rates for PassPorter readers. To reserve the PassPorter great rates, just use this link to the Radisson Resort Parkway web site. Here are those great PassPorter deals and rates (these rates are the LOWEST that you can find anywhere for the Radisson Resort Parkway, whether you look through the Internet, through a travel agent, or go directly through the hotel). Want to stay in style without paying the extra cost? You can get a complimentary upgrade to a pool-view, deluxe room with this deal. This is a $15/night value! 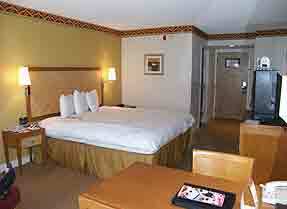 Just book a courtyard room through our Radisson link, then type the promo code UPGR in the Promotion Code Box. Note that your total will be adjusted by the hotel to reflect your discount after you make your reservation. If your family is larger than 4, you know how frustrating it is to get hotel rooms. So here's a deal for you! Book one room and get the second at 50% off. Parents get a king-bed room connecting to a kid's room with two double beds. To reserve this special, you must first book two rooms using our Radisson Link, then enter the promo code B150 in the Promotion Code box. Note that your total will be adjusted by the hotel to reflect your discount after you make your reservation. Note: There may also be a "Bed & Breakfast Package" available, which offers a full breakfast buffet for two adults (and kids 10 and under eat free). Check our Radisson Link for details! * Note that these rates do not include 12% tax and are subject to availability. There is no additional resort fee. PassPorter's rates and deals cannot be combined with other offers. 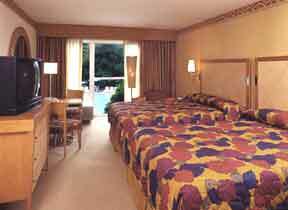 Cancellation policy is 48 hours prior to arrival to avoid one night room and tax penalty. Remember, to get these great rates you must use our link to the Radisson Resort Parkway web site. Or you may call 800-634-4774 and ask for the "Y-PASS" rates. 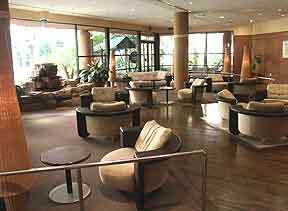 The seating area in the lobby. Phone: 800-634-4774, 407-396-7000, or 407-396-6792 (fax) - Remember to ask for the "Y-PASS" rates for our special PassPorter rates!